20 seater Niku Katsumata is all about the beef. 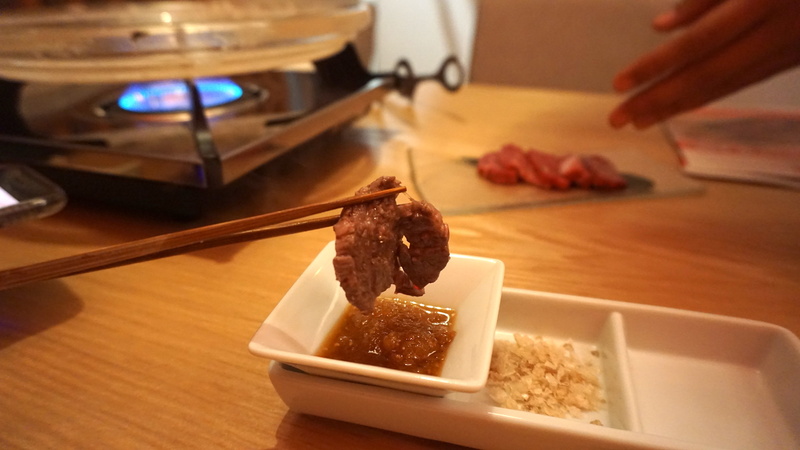 Originally from Tokyo’s Ebisu district, this Duxton Road restaurant is great for meat lovers who want to savour a little bit of luxury. Now, you know me: I love a good serving of beef every so often, so this place definitely had my attention. 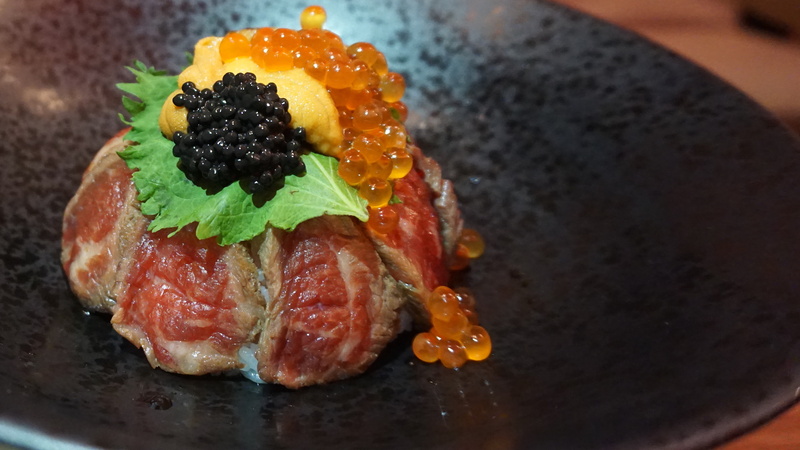 Niku Katsumata’s special A4 Wagyu Set ($38++) is available for dinner, and boy is it great value. It packs five dishes into one meal, and I was impressed at the quality of the items on this set menu. 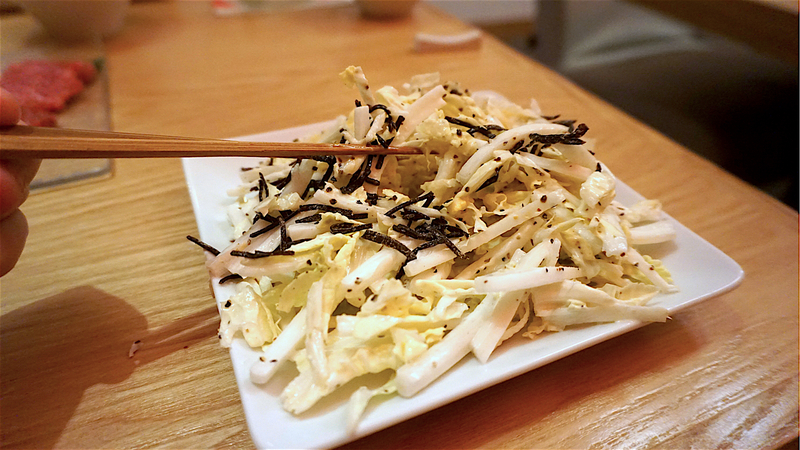 I started my meal with the Chinese Cabbage Salad Topped with Umami Seaweed, a blend of crunchy cabbage and highly appetising seaweed. I liked how the crunch of the cabbage went well with that saltiness of the seaweed, helping me layer my tummy and open up my tongue a little. The other starter, a Homemade Kimchi and Seasoned Sprout was reasonably good, but I’d say the cabbage was the more unique opener. Yes you’ll get 6 slices of beef, each from a different succulent cut. 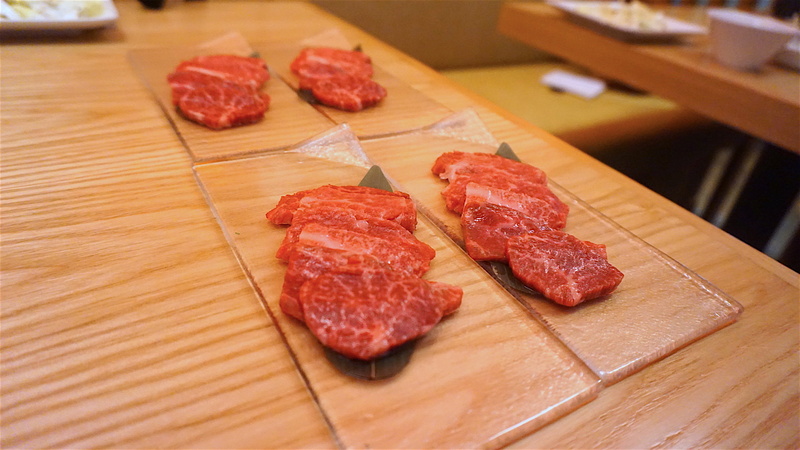 Your server will cook them one by one, and ask you to sample the cooked meat with either a sauce or some salt. Follow suit, and you’ll realise that there are varying levels of fat and muscles with each cut for you to savour. I think this was interesting, because the order upon which I was served did not follow an increasing gradient of fatty tissue. 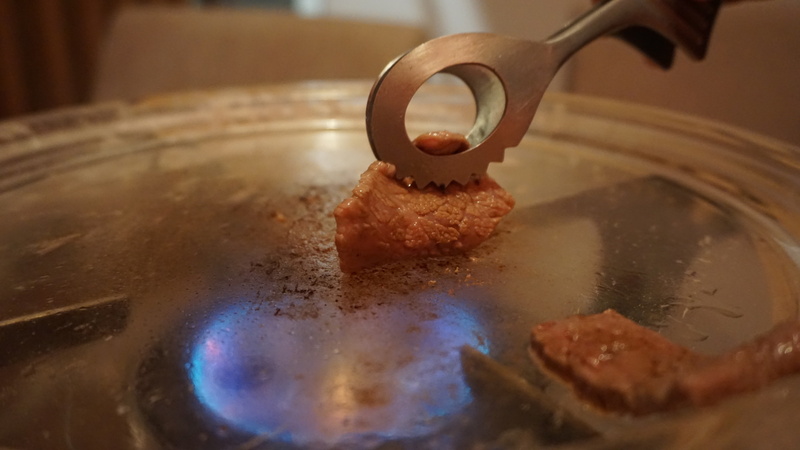 Instead, I was experiencing a deeper flavour of beef as I progressed through the slices. 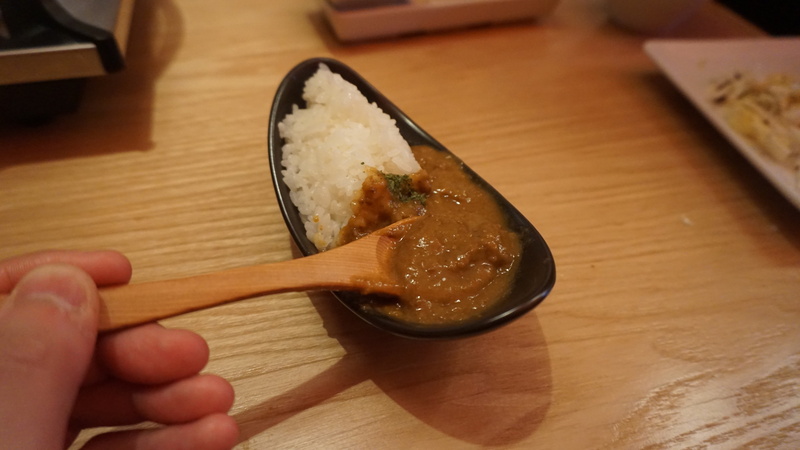 However, I must say that the winner here is the excellent Japanese A4 Beef Curry Rice! I love this dish for it’s comforting combination of sweet curry and soft chunks of beef. The warm, fluffy rice just adds to the simple pleasure that this dish provides. 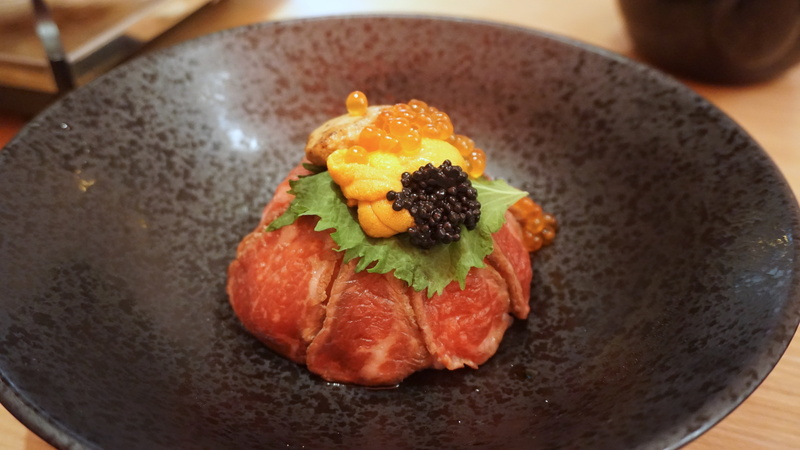 If you’re seeking something a little more substantial, or if you’re looking to splurge on a payday dinner, then the Tataki Wagyu is the dish you’re looking for. I love the idea of this dish because it’s actually customisable. You start out at $20++ for a bowl of premium grade A4 wagyu beef that is browned slightly on the surface served on top of Japanese rice. The bowl comes with a small container of bonito soup stock that you can add to your dish if you want. However, if you want to kick it up a notch, you can add $5++ for premium ingredients like uni, ikura, foie gras or caviar. If you want everything at one go, just like in the picture, you can do that too! It’s $40++ but like I said, it’s a payday splurge so go ahead and treat yo’ self! 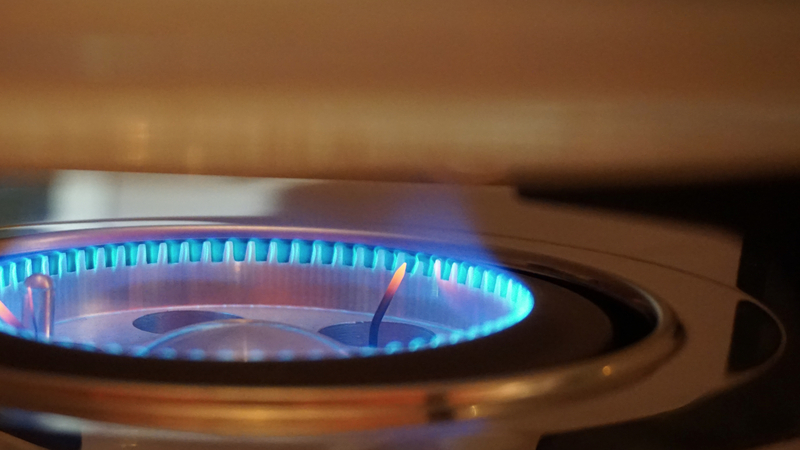 Edit: I received some feedback from a friend that service was slow on a Wednesday Night dinner, so if you’re thinking of going, do make time for a 90 minute dinner.